We were spending a day at the tasting rooms of Woodinville, north of Seattle in Washington state when we popped into the Long Shadows storefront. If you haven’t heard about this concept, I guarantee it will intrigue you. Since 2000, former Chateau Ste. Michelle president and CEO Allen Schoup has worked with colleagues and resident winemaker Gilles Nicault to partner with internationally renowned winemakers. Each produces a wine from the grape they are famous for having produced in their home countries – and that’s where the ‘Long Shadows’ name comes from. This Syrah – the Sequel – has been made by John Duval. Yes, the John Duval of 28 years of Penfolds Grange fame. John Duval who won the 1989 winemaker of the year award at IWSC, London. John Duval whose 1990 vintage of Penfolds Grange won Wine Spectator’s wine of the year award in 1995. I think you get the point. This wine made me sit up and take notice before I knew Duval had created it. Our Long Shadows host, Nina, was also a great fan. ‘Sequel’ (named so to indicate Duval’s wine life post-Penfolds) is an opaque purple with a thick violet coloured rim and deep legs. The developing aromas are intense and show blackberry and cocoa bean, some salumi, olive, crushed herbs and minerals. The palate is dry with a juicy acidity and ripe tannins with some grip to them yet. Although the alcohol is high, there is no sign of boozyness. This is one well-balanced wine. The intense flavours include more deep black pepper and fruit – blackberry, currant and Italian plum – with heavy rosemary and thyme, more meat, leather, some Dutch licorice and a long finish. Complex, layered flavours and aromas combined with the balanced alcohol, acidity and tannins offer a wine drinking beautifully now but yet which will also age well for 5-7 years. 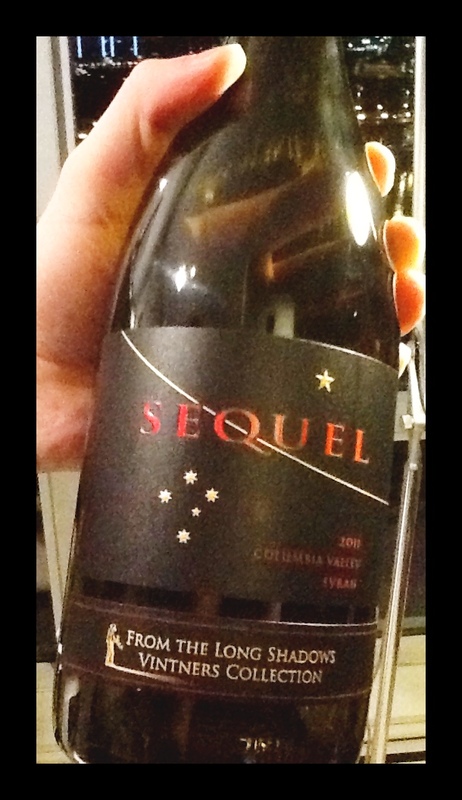 This entry was posted in OTHER, RED, Shiraz / Syrah, Washington State and tagged allen schoup, gilles nicault, john duval, long shadows, red wine, sequel, syrah, walla walla, washington state. Bookmark the permalink.